The Namib Desert has been in existence for the last 43 million years making it the oldest desert in the world. It has maintained its current state and form for the last 2 million years. The cool coastal desert also boasts of the world’s largest sand dunes, rugged mountains, and most expensive gravel plains. 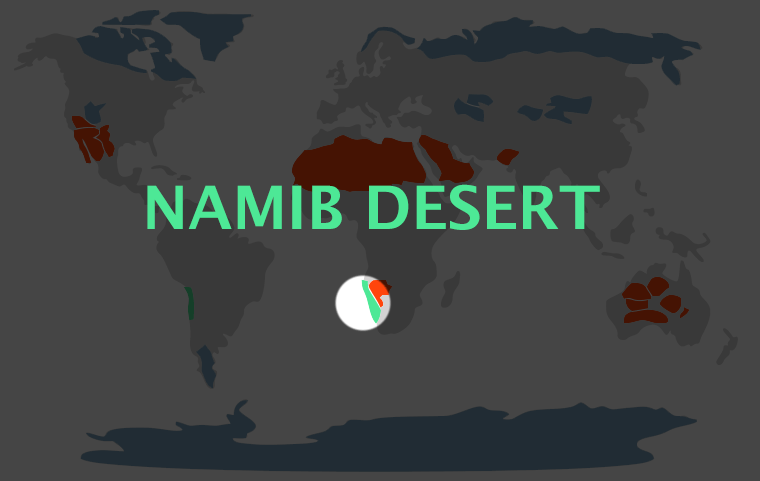 The name “Namib” (Portuguese Namibe), which means “vast area with nothing on it” was derived from the Nama language, and Namibia (Namib’s chief home country), got its name from the desert. Despite the Kalahari Desert being located within the same region as Namib, the former is not considered a true desert because it records stable annual precipitation occurring in small amounts. Namib is a coastal desert that extends 1,200 miles (1,900 km) along the Namibian Atlantic coast, flowing into southern Angola, and touching parts of Northern Cape Province in South Africa. 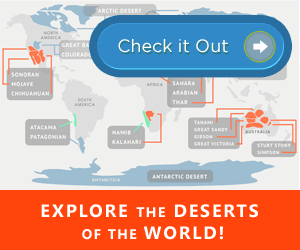 The desert’s total area is about 31,200 m² (80,000 km²). Due to its immensity, Namib takes up the entire western part of Namibia. It is worth noting that the country is the 34th largest in the world with an area of 824,292 km2. Namibia is also the second least densely populated country in the world simply because desert takes up much of its area. Namib’s east-west width ranges from 30 to 100 miles (50–160 km). In other sections of the desert, the width spans hundreds of kilometers. The southern section of Namib joins the Kalahari Desert at the plateau on the Great Escarpment’s top. Namib can be viewed as comprising three successive strips from north to south: the narrow Atlantic coastal region; outer Namib, which occupies the remaining western half of the desert; and the Inner Namib, which takes up the eastern portion. There are large transition zones that separate these three regions. Namib’s climate is as interesting as it is contradictory. The coastal strip of the desert receives no rainfall despite the air in this region always dancing around the saturation point. The cold Benguela Current, which dominates the northern parts of the coast, is responsible for cooling the air in this region, resulting in dense fog. The reason there’s probably no precipitation is because the cool air from the ocean current flows inland in from a southwest breeze, thus creating a temperature inversion of with a 1,000 feet (300 meters) thickness. Hot, dry air rises above it, and fog occupies the space below. There’s no significant difference between coastal day and night, or winter and summer temperatures. They all share a constant range of 50 and 60 °F (10 and 16 °C). Inland temperatures do not exhibit similar characteristics: In the summer, the Namib desert experiences record highs of 80°F (26.6 °C) and lows of (86 °F) 30 °C. In regions that are not influenced by cooling sea breeze, the temperatures may rise to the expected 100 °F (38 °C) in low-latitude deserts. While there’s no rain in most of Namib’s year, it may occasionally receive about 0.5 inches (13 mm), and as much as 2 inches (51 mm) of precipitation on the coast, and inland, respectively. The Namib Desert comprises of six vegetation regions: 1) the coastal, characterized by vastly succulent vegetation, which thrives on the moisture contained in the fog; 2) Outer Namib, which is essentially barren; 3) the steppes of the Inner Namib, which during the wet years, are normally covered with annual and perennial shortgrass; 4) the Inner Namib dunes, which are endowed with tall grasses, and bushes; 5) the larger river channels with acacia as the dominant tree growing there, and; 6) the southern winter rainfall region, which is covered by a succulent bush growth. In the Inner Namib’s plains and dunes, you are bound to encounter a number of Antelope varieties including the springbok, and gemsbok (Oryx). Zebras and ostriches are also found in these regions. Northern Namib has a richer animal distribution that includes lions, hyenas, rhinoceroses, elephants, and jackals. They mostly occupy the areas bordering rivers that flow into the Atlantic from the interior highlands. The Outer Namib dunes are home to reptiles such as geckos and snakes, and insects. There are no mammals in this region. Namib’s coast has a rich bird population that includes pelicans, penguins (in the southern parts), and flamingoes. Until the early 20th century, the San wandered around the Namib. They survived by gathering anything that was edible along the coastline, alongside hunting in the Inner Namib. They derived water from the tsama (tsamma) melon, which contains bitter juices. Today, a few members of the Herero community herd cattle and goats, which are sustained by the water holes scattered across Kaokoveld’s desert part. A few Topnaar Nama Khoekhoe people will also be seen grazing their goats and sheep along the Kuiseb River, which is surrounded by riverine vegetation. Apart from those few groups, the larger Namib Desert is neither occupied nor used. The aboriginals previously living there have since left and adapted to modern ways of life. This doesn’t mean that Namib is entirely unproductive. Within the innermost steppes, the southern half of the desert are mostly private ranches owned by Europeans. The ranches are used for rearing Karakul sheep with labor provided by the locals. The bigger parts of Northern and Central Namib are used for conservation and recreation. For instance, the central region is home to the Namib Desert Park where a variety of zebras, ostriches, and antelopes reside.